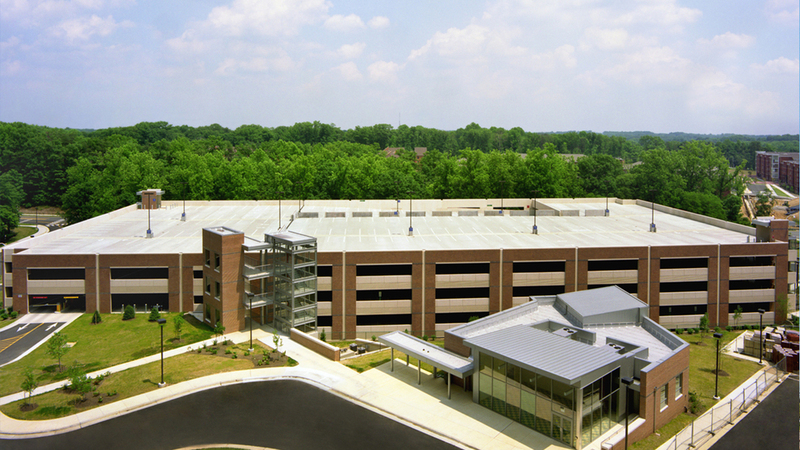 George Mason University Parking Structure | Cary Kopczynski & Company, Inc. Architect: Ai Architecture, Washington D.C.
George Mason University contracted with a proven parking structure team, which included CKC, to increase parking capacity. The result was a handsome, efficient, and cost-effective five-level, 350,000 square foot garage that provides parking for over 1,200 vehicles. After a careful evaluation of several structural systems, precast proved most appropriate for this project. CKC’s experience with all contemporary structural systems proved very useful in this evaluation and makes CKC an asset to any parking team. CKC also provided structural design for a stand alone, 3,000 square foot retail building next to the parking structure. The steel structure is framed with bar joists and steel beams.